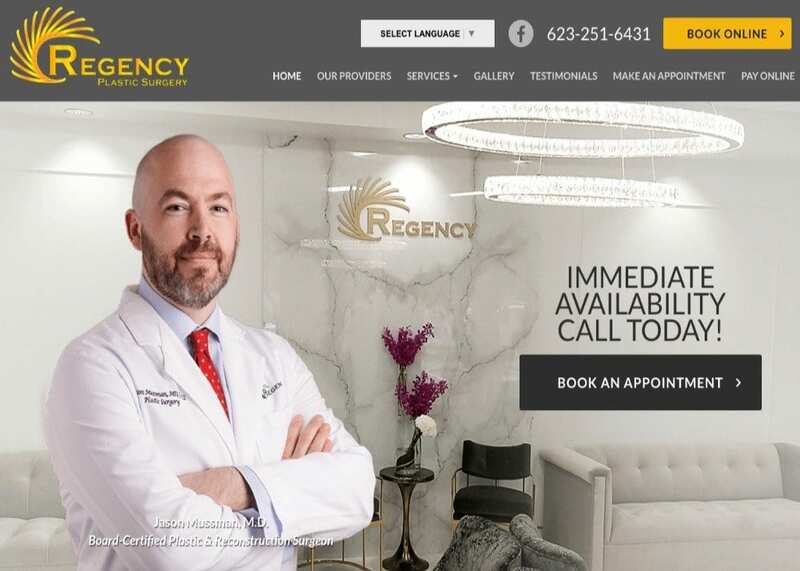 Regency Plastic Surgery is all about providing the most advanced cosmetic and reconstructive procedures by the most experienced and respected plastic surgeons in Arizona. When dealing with any reconstructive or cosmetic work, we understand what the target audience is looking for. We immediately set out to provide Dr. Jason Mussman a custom website that was luxurious and classy. First impressions matter – we made sure to highlight this within the project design. The overview of the website design is targeted to look modern and sleek with easy navigation for patients to look for the desired information without much hassle. When dealing with a cosmetic or reconstructive specialty, it is important to understand that displaying luxury and class along with compassion and understanding can go a long way in providing patients with the confidence they need to experience an anxiety-free procedure. We went with a full-width layout as well in order to ensure that the site was modern and classy. To display a sense of reserve and elegance, we used gold and gray color theme. Notice how the gold used throughout the website is also used on Regency’s personalized logo as well. Gold conveys both quality and enlightenment. Patients who come from a higher class can feel empowered and at home on this website. The gray is makes the website feel neutral and reserved, making it a perfect color choice for both young and old web visitors. The site was designed to be responsive and quick. We understand that patients always have second choices. We needed to make sure the website ran at an optimal speed to ensure that web visitors would remain engaged and focused. We utilized a hamburger menu that condenses when the web page is shrunk. A hamburger menu also allows more space on the main page for viewers to navigate on. We also used an autoplay slide show along with an ample amount of professional photos to display the services shown. To harmonize the use of both text and images, we utilized square borders to ensure that all aspects of the website would remain aesthetically pleasing. Placing testimonials on your site is a great way to make a standout impression on skeptical web-visitors. Testimonials place credibility and proof of results in your work and experience. We also use testimonials on our very own website as well! We dedicated an entire tab on the navigation menu solely for testimonials and reviews. The website also utilizes SSL Security. This means that any important data that patients enter on the site are encrypted before being logged in the database. In addition to security, we place a convenient button on the home page that allows patients to book an appointment at ease. The image the website reflects is an elegant and classy one. From the color theme to the layout of the website, Regency displays nothing but trustworthiness and top-notch work ethic. The images on the website also display nothing short of quality work and experience from the Arizona natives.